I’m writing this to check in, with myself mostly, but also with those of you taking medication for Bipolar Disorder. It has been almost one year on my current cocktail of Lithium, Seroquel, and Abilify. As a reminder, I was put on (varying doses) of this combo after a terrible mixed episode last fall. In the beginning it was considerably difficult to build a new med routine since I was so used to taking only Trileptal twice a day. But with the assistance of my amazing wife, I was able to get on board. After about 6 months, I even began sorting and distributing them myself. I know many of you know what a small victory that can be! Medication management can be challenging. Important factors include making sure each script is filled, that you have enough for tomorrow, how many you are taking, how often, knowing what to do if you forget to take it, being aware of and dealing with side effects, whether you need to have blood drawn or not, having effective communication with your doctor and pharmacist, and of course being able to monitor how your meds are affecting you. Whew! It really helps to have someone close to you that you can talk about your medications with, or that can lend a hand in monitoring and managing your meds. Also, utilizing calendars or alarms on your cell phone (like I do!) to remind you what time to take your pills is really handy. 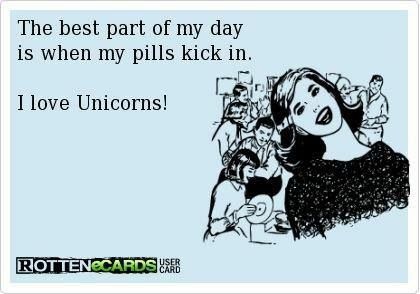 Developing a solid routine that works for your schedule is important so taking your meds becomes like second nature. These are just a few tips I picked up within the last year that have worked for me. So far, I am doing well, and I feel pretty stable. There will always be ups and downs and mood swings, but the medication change was definitely necessary and saved me from a trip to the hospital. Every so often we all need to check in with ourselves and take personal medication inventory.